You answered the survey and we worked with Leger to crunch the numbers. These are the top 12 neighbourhoods in Calgary in 2016 based on those survey results. What makes a community a great place to live? That’s what we asked Calgarians who responded to Avenue‘s seventh-annual online survey to find the city’s Best Neighbourhoods. From crime rates and property taxes to walkability, green space, businesses, schools and access to major roads, among other categories, survey respondents identified those neighbourhood attributes that matter to them most. The survey has evolved over time. Starting last year, we no longer allowed respondents to vote for their own communities as a favourite in any particular category in order to increase fairness and objectivity. This year, we tightened the survey further, making it slightly shorter. But, essentially, the 2016 survey was the same as 2015’s, meaning we have a direct basis for comparison year to year. Working with Leger, a research and marketing company, we took data collected by the survey and our own research and crunched the numbers for nearly 200 neighbourhoods to deliver this year’s list of Calgary’s Best Neighbourhoods. No two people value exactly the same community attributes in exactly the same order, but the result of our survey shows what the majority of the respondents valued highest and how they ranked their preferences – and this year there were a couple of surprises. Last year’s respondents valued walkability as the most important attribute in the neighbourhood they wished to live in, but this year’s respondents reported that access to parks and pathways was the most important neighbourhood amenity. This year’s respondents next wanted their neighbourhood to have low crime, to feature restaurants, coffee shops, bars or pubs and to provide access to major roads, in that order. Surprisingly, walkability dropped from first to eighth place this year. All in all, what it shows is that what matters most to Calgarians one year may change in the next, which is why our list of Best Neighbourhoods changes from year to year, sometimes only a little and sometimes a lot, with every neighbourhood offering something of value to someone. -J.W. 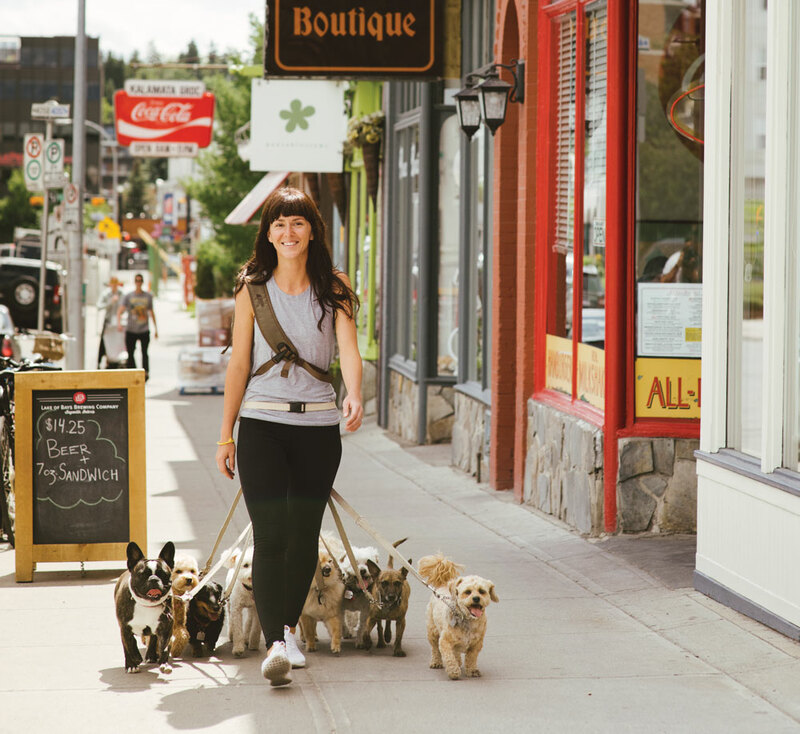 Dog walker Sarah Elliott of Mind Body Soul Dog Walker. All photography by Jared Sych. The story of the Beltline stretches back to the far-off year of 2003, when the communities of Victoria Park and Connaught merged and the union was named in honour of the Belt Line, the nickname for the Calgary Municipal Railway’s route No. 5, which once ran through the area. Today, the Beltline has become a hub of activity in Calgary. 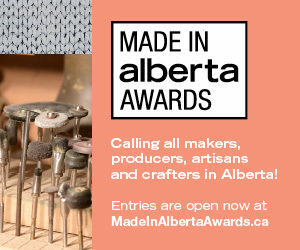 If you’re looking to find yourself in the metaphorical and geographical heart of the city, you can follow the beat to the neighbourhood that’s home to the Calgary Stampede and the happening 17th Avenue S.W. strip. Ranked the No. 1 most livable neighbourhood in this year’s survey, a title it first acquired last year – and which it only narrowly missed out on in 2014 – it’s clear Beltliners have got a good thing going. The reasons for this neighbourhood’s appeal are plain to see. With a wealth of grocery stores ranging from giants like Co-op Midtown Market to mid-range and niche food purveyors like Sunterra Market and Janice Beaton Fine Cheese, it’s easy to bring home the perfectly cured bacon. When you can’t bring yourself to throw something in the oven, there’s a long list of award-winning restaurants like Justin Leboe’s Pigeonhole or Roy Oh’s Anju. You can enjoy a serene, green lunch at Boxwood in Central Memorial Park or explore the cocktail culture at lounges like Milk Tiger and Proof. This neighbourhood is well versed in the ABCs of local coffee shops thanks to Analog, Bumpy’s Cafe, Caff Beano and others, meaning you don’t have to get your java from a chain if you don’t want to, though there’s plenty of them around, as well. True, the Beltline does fare poorly in criteria like crime, but, with the highest concentration of arts and entertainment options outside of downtown, a great walkability score and access to public transit, Calgarians will be buzzing about (and around) the Beltline for years to come. -A.G.
A neighbourhood established in 1960, Brentwood is a perennial contender in our annual survey, mimicking the Beltline in retaining its 2015 ranking and moving up from its third-place position in 2014. This beautiful northwest neighbourhood wins a lot of points for its strategic placement, a sweet spot nestled between Nose Hill Park, Shaganappi Trail, Crowchild Trail and the LRT line, letting residents get away from it all, by car or foot, when the mood strikes them, and ensuring that downtown is still just a quick ride away. With such great recreational opportunities at home, though, it’s a wonder anyone feels the need to find their fun elsewhere; both the Sir Winston Churchill Aquatic & Recreation Centre and the Brentwood Sportsplex provide great workout opportunities (not to mention the hiking in Nose Hill Park). 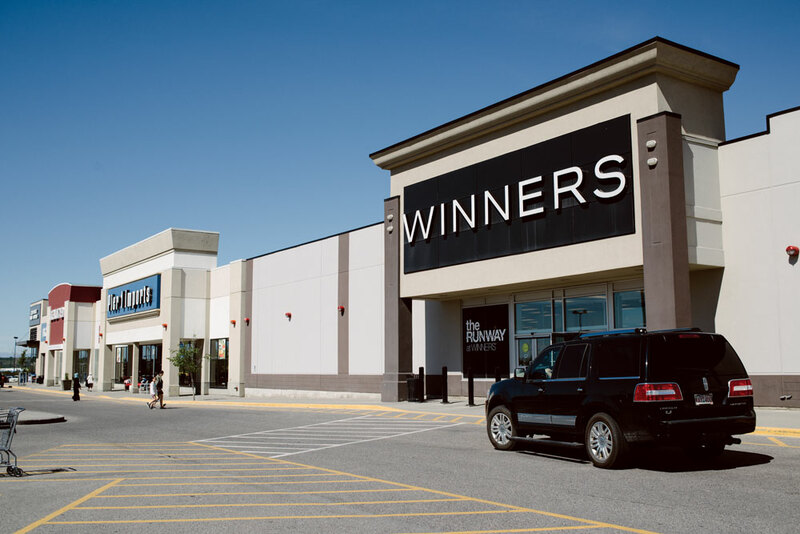 Brentwood Village shopping centre and, until it undergoes redevelopment, Northland Village Mall ensure competitive shoppers can get their 10,000 hours in, as well, with nearby Market Mall forming a perfect purchasing trifecta. 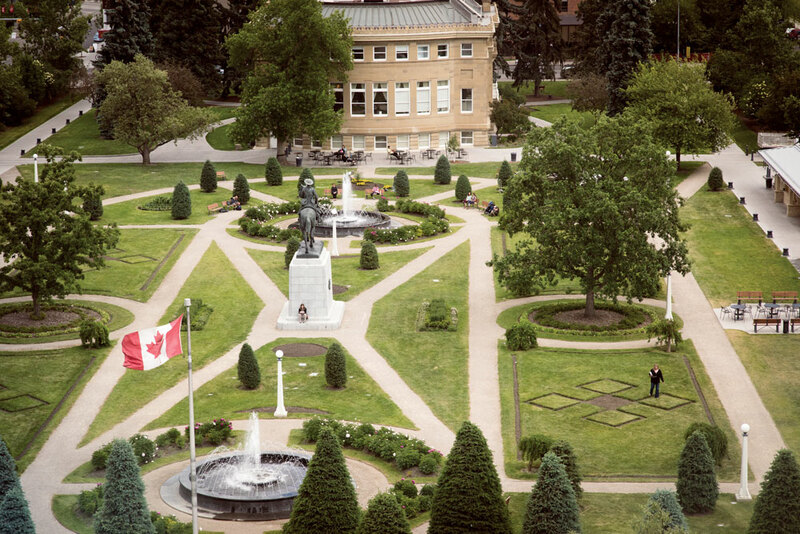 It’s not surprising that Brentwood scored well for schools, with more than a dozen educational institutions in the 2.9-square-kilometre area, not to mention the nearby University of Calgary, offering the option for schooling from cradle to college and beyond. While the community offers up a lot of benefits, residents seem to pay it forward, with high community engagement, meaning whether you’re in one of its many grocery stores, drug stores or coffee shops, you’ll meet people who take being neighbourly to the next level. -A.G.
Skyrocketing out of last year’s 26th place, Dalhousie has joined its neighbour, Brentwood, in the top three this year, and with good reason. Another northwest neighbourhood that borders Nose Hill Park, Shaganappi Trail and Crowchild Trail, Dalhousie has access to many of the same benefits that make Brentwood great, without much of the same scrutiny its neighbour receives. Named for George Ramsay, the 9th Earl of Dalhousie and governor-in-chief of British North America from 1820 to 1828, the neighbourhood was annexed by the city in 1961 and developed six years later. Since then, it has flourished, enjoying all the benefits of living near a wealth of green spaces while resting on the western edge of the city, with Crowchild Trail providing a quick exit to the Rockies for weekend getaways. The key to Dalhousie’s high ranking is that many of its amenities ranked in the high 30s to low 10s, allowing it to maintain a decent all-around score by avoiding bottoming out on low scores in heavily weighted criteria that tended to drag other neighbourhoods down. 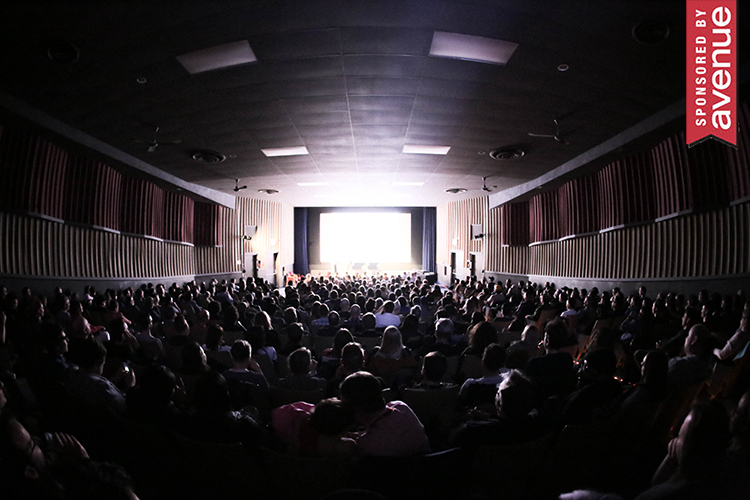 Dalhousie’s strong suit is its community engagement, which, if you’ve been to the Calgary Folk Club‘s events, the community’s seasonal gatherings or participated in its sports programs, you know is one reason this neighbourhood is making its mark. 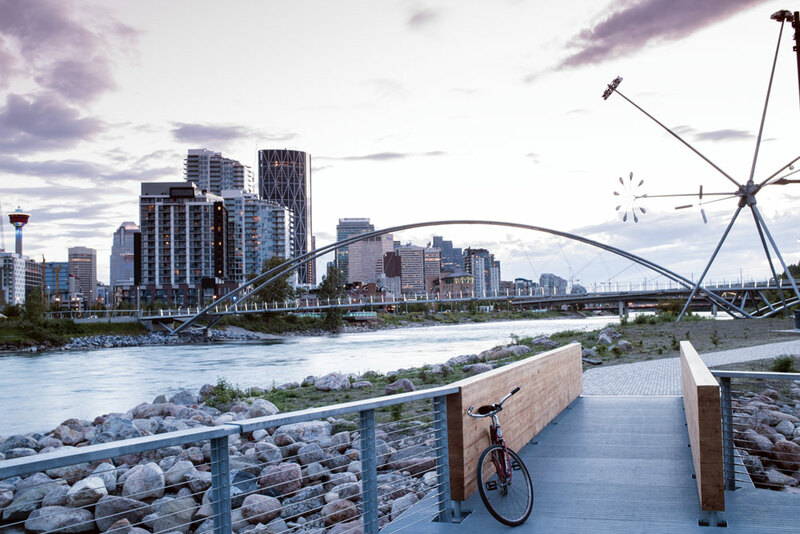 -A.G.
For a small-town vibe with a skyline view and easy access to the downtown core, look no further than one of Calgary’s oldest communities. With more than 100 shops and services and endless recreational opportunities, Hillhurst is as appealing to families and long-time residents as it is to young newcomers. A weekly flea market, seasonal farmers’ markets and a variety of festivals and events keep this community bustling year-round. Tree-lined streets shade both historic and modern homes that house residents who are able to take advantage of some of the hottest spots in the city including restaurants like Brasserie Kensington, pubs like Oak Tree Tavern and cafs like Higher Ground. -N.H.
A First World War monument of 16,000 stones forming the battalion numbers 113, 51, 137 and 151 marks this south-west community’s iconic broad hillside. With the “113” already designated an Alberta Heritage Site, this piece of local history is nestled between ridgeside homes that enjoy a panoramic view of the Rockies and a sprawling, bustling commercial hub with grocery stores, shops, a movie theatre, restaurants, dental, medical and banking options, plus what’s widely considered the best Winners in the city. A busy public library branch and the Westside Recreation Centre serve as popular community hubs. Well-planned and well-used pathways throughout the area now extend along Sarcee Trail, linking all the way to Edworthy Park and connecting Signal Hill to the rest of the city. Approximately an hour’s drive from the mountains and just minutes from downtown, thanks to the new West LRT leg, Signal Hill residents are just a stone’s throw away from it all. -E.C. 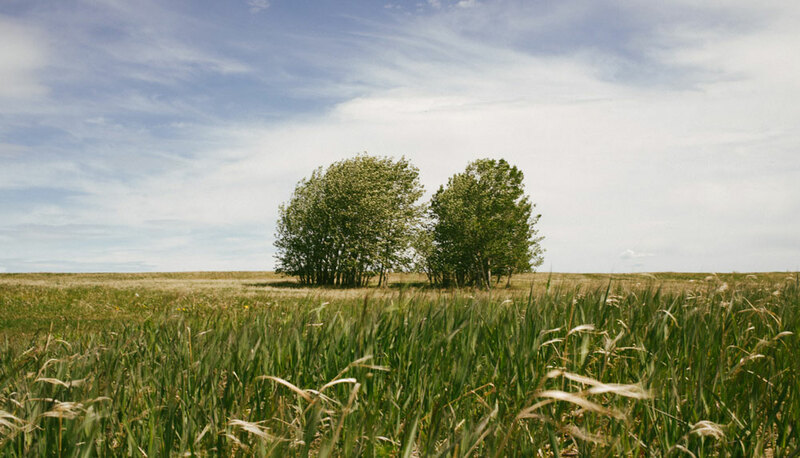 While the rest of the city spends the summer and winter seeking refuge outside the city limits, residents of Arbour Lake are busy indulging in the privilege of living in one of northwest Calgary’s two lake communities. Modelled after popular neighbourhoods in southern California, Arbour Lake is a robust community that comes together for a jam-packed schedule of programming year-round, including swimming, boating, fishing and ice-skating. Clear mountain views help residents remember to be thankful for what’s in their own backyard, including the amenities of Crowfoot Crossing. Should they ever want to leave, major roadways like Crowchild and Stoney trails are easily accessible. -N.H. The Station Pub and Grill. Few people are lucky enough to say they have giraffes and tigers for neighbours, but proximity to some of the city’s top attractions like the Calgary Zoo, Telus Spark and St. Patrick’s Island isn’t even the only thing Bridgeland/Riverside residents have to brag about. This hip and walkable neighbourhood is also home to an eclectic mix of shopping and dining spots, including Bridgeland Market, Lukes Drug Mart, Burger 320 and Shiki Menya. The neighbourhood also boasts proximity to downtown and easy access to transit. And as an added bonus, each July, south-facing residents get a free view of the Stampede’s fireworks show. -N.H.
Ranked No.1 in parks and pathways, this aptly named northwest community enjoys the perks of suburban life with pristine views of both the downtown skyline and mountains. Thanks to sparse commercial development, Scenic Acres enjoys a large amount of green space that is frequented by wildlife as much as it is by locals. The great trail system keeps Scenic Acres residents outdoors and connected. What it lacks in businesses, it makes up for in community spirit. An active community centre and countless volunteer-led initiatives like a community-built skating rink and a lively Stampede breakfast make Scenic Acres a top choice for families. -N.H. Call it a small, inner-city community with a big heart. This 76-year-old southwest neighbourhood includes residents with disabilities at Pacekids Society and a John Howard Society-run home for youth in transition. It’s a place where kids grow up and leave, only to return later to raise their own families. That’s not surprising when your home is walking distance from the Elbow River pathway system and amenities like Chinook Centre. It also doesn’t hurt that downtown is a 15-minute bike commute away and that Browns Social House pub and Village Ice Cream recently opened shop just blocks away. -E.C. The fact that Huntington Hills ranked in the top 10 in the playground, recreation facilities, school and library categories should tell you everything you need to know about what the residents of this expansive northside community value. Sitting just east of Nose Hill Park, one of the largest urban parks in Canada, Huntington Hills is home to 15 schools, a vast outdoor playground and a sportsplex with a hockey arena and an eight-sheet curling rink. This past March, a newly opened skate park helped to solidify Huntington Hills’ status as one of the best neighbourhoods in the city when it comes to recreation. -N.H.
For more information on the method, click here. Our Best Neighbourhoods survey took place from late 2015 to early 2016. In partnership with Leger, we asked Calgarians which characteristics they most value in a neighbourhood. We supplied data on each of 178 established residential communities for each of those characteristics to Leger, which were used to create rankings in individual categories. To calculate best overall neighbourhood, rankings in categories most valued by survey respondents were given more weight. Neighbourhoods: Neighbourhood names and boundaries follow those defined by the City of Calgary. Demographics: Population and percentage of single family dwellings was taken from the City of Calgary Community Profiles, which contain information from the 2015 Calgary Civic Census. Property value: Data gathered from the City of Calgary Property Assessment and Market Report 2015 and City of Calgary Property Assessment and Market Report 2016. Walk Score: Rankings determined by Walk Score, a private company that measures walkability by calculating the distance to amenities. Parks and pathways: City of Calgary Parks and Recreation maps were used to identify and count major parks and pathways. Crime: Calgary Police Service statistical reports from January 2015 to November 2015. Crimes were divided into personal crimes and property crimes, with personal crimes given more weight. 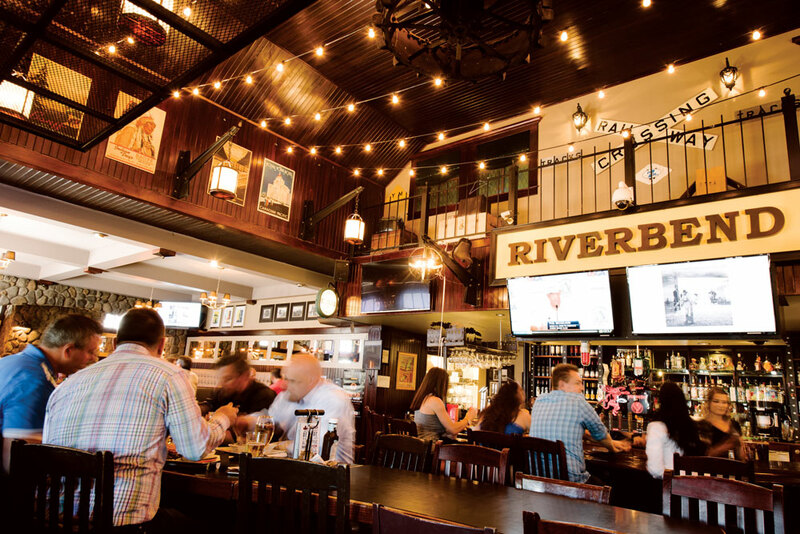 Businesses: Data for restaurants, retail bars and entertainment in neighbourhoods was determined using the City of Calgary’s business license catalogue. Community engagement: Data based on voter turnout in the 2013 municipal election, weighted per capita.